The Power and the Peril of Oil is a passionately written account about how oil has given strength and empowered some Middle Eastern countries while it has imperiled others, causing numerous problems. This book documents the history, politics, and players in the quest for dominance of the region and its highly prized resource. It explains how oil has been the criteria for choosing allies or enemies for the U.S. disregarding the hidden consequences. It is an eye opening, captivating read, full of scintillating documents, maps, images, and facts, peppered with straightforward information about the history of Iran’s nuclear program. Written from the author’s firsthand experiences, personal knowledge, and research, the book provides information on the major players and moneymakers in oil, the influence of Islam, the complexity of the Middle East, and Iran’s geopolitical importance today for control of oil. The failure of the U.S. to gain control of Iraq and its oil has made Iran a more sought-after target for the greedy, rich oil companies. Iran’s nuclear program is being used as an excuse and a pretense for starting a war for oil with Iran. The accusation by U.S. politicians and the Prime Minister of Israel, Benjamin Netanyahu, that the Islamic Republic of Iran is trying to build a bomb to destroy America and Israel is far from the truth. It is one more deception by politicians and the mainstream media, deliberately trying to make the public believe something that is not true. Allegations in regard to Syria and Iran are similar to the erroneous claims made about Iraq. Admittedly, Saddam Hussein of Iraq was a tyrant dictator. There are other dictators in our world like him and even worse, such as King Abdullah of Saudi Arabia with his notorious record on human right issues. Saddam was not a threat to the world or the security of the U.S., but he was to Israel. He was a stabilizing force and held his country together. Osama bin Laden himself called Saddam a “sick Arab,” for not aligning with Al Qaeda nor allowing militants access into his country. Today Iraq is divided, and insurgency and terrorism have made it a human slaughterhouse. My intention in writing this book is to disclose enough information so that responsible leaders, politicians, and the general public can make wise and informed decisions, in the hope of preventing another war for oil and further economic hardship to the U.S and the rest of the world. Through my personal experiences, I have witnessed my birth country, Iran, ruined by oil and foreign politics. It is difficult for me to see my second country, America, possibly be destroyed because of wars for oil and politics of Israel and Saudi Arabia. By showing the other side of the coin, we could be one step closer to peace in the Middle East. One of the hidden problems of a war with Iran, which the mainstream media does not report, is the possible negative consequence. I concur with General Dempsey, the former commander of Joint Forces in Afghanistan and the Middle East, saying that: “A war with Iran at this point would be disastrous, foolish, destabilizing, and not prudent”. Iran is well prepared to defend itself as Persians are united. It is quite different from the situation in Iraq, where the population is divided into Kurds, Shi’ites, and Sunnis, and the U.S. was able to break the mold between the three groups and topple Saddam. Iran is a much larger country with a population three times greater than Iraq, and has the capability to close the Strait of Hormuz. In addition, it has several strong allies, such as Hezbollah and Russia. There is no doubt that Iran’s military is not comparable to that of the U.S., and the American military would be able to take over that country within a short time. However, I would expect that the guerrilla warfare and covert retaliations would never end. I fear that not a single foreign soldier would come home without harm – mental or physical. Also, Russia would not want the U.S. to have another military base on its doorstep. Furthermore, Iran supplies natural gas to Pakistan. A war with Iran would interrupt the flow, and Pakistanis would have to live in the dark, which would not be without retaliation toward those who attack Iran. I felt an obligation to write this book, because of my knowledge about the culture, the history, and the people of the Middle East, especially Iran. Therefore, after months of research for my well-received presentations on ‘The Power and the Peril of Oil’, as a guest-lecturer on cruise ships I began writing. I thought that more people in the world should be aware of the perils of oil, which are often hidden and much more damaging to countless people, than the power or value it brings to the wealthy oil companies, tyrants, dictators, religious leaders, and some countries. Writing is my passion, and I want to make a difference, hoping that through my books I can be instrumental in fostering peace in the Middle East. “If I sit silently, I have sinned”, is a poignant and valued saying by Dr. Mossadegh. And to quote Nelson Mandela: “When a man has done what he considers to be his duty to his people and his country, he can rest in peace”. I, too, feel a moral responsibility. Congratulations on writing and publishing your book! The packaging is extremely professional. The front cover image immediately drew my attention and does a great job of marketing the book to your readers. 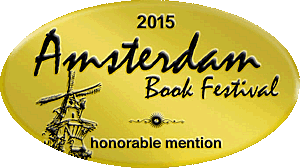 The book is highly informative and is an important read for Americans and people from around the world. I appreciated that you included so many references and reading suggestions at the end of the book. You have clearly done a great deal of research and you present your material in a conversational, reader-friendly style. You present enough evidence to make your point without belaboring it, keeping the pace brisk. The structure and organization of the book are strong. You have a wonderful collection of photographs, maps, and other images, all of which are reproduced with great clarity on these pages. I particularly appreciated the excellent use of color, which really sets this book apart. Great job with grammar and proofreading. The formatting of the interior of the book is excellent. 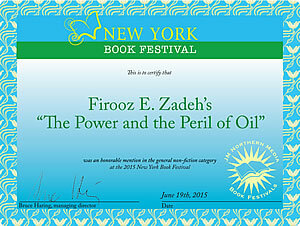 Firooz, I wish to congratulate you on a superbly compiled work on a complex topic – Oil and the Middle East. As an English teacher, I can scarcely believe it has been written by a non-native speaker. Your long period of earnest enquiry has paid off handsomely. This work should prompt those of us who are daily bombarded with journalistic half-dash truth and lazy untested assertions, to burrow further into this complicated world of intrigue and power politics. I look forward with eager anticipation to your next publication. Firooz your book is so timely and right on the spot about oil, Islam, Iran, and the Middle East. The way things are going you may have to make some changes! The USA may partner with Iran to save Iraq’s bacon from the Sunnis because there is no other option or another country to ask for help in this situation in Iraq. Also, now that the U.S. and Iran are actually in talks about Iran’s nuclear program the ball game has to change. So Firooz you, may have to change things from “why we should partner with Iran” to “why it was a good idea to partner with Iran”. The Power and the Peril of Oil, is an insightful and enlightening piece of literature. Firooz Zadeh gave me a rare insight into the complex and confusing world of the Middle East’s greatest ‘asset’ oil. 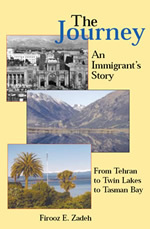 It also introduced me to the life of the Iranian people, both in Iran and abroad. They truly live in a beautiful country and one they obviously love a great deal. Jenny Bates, Waimea Weekly and Nelson Weekly Oil’s Human Cost Divulged: For such a small book The Power and the Peril of Oil is an information blockbuster that reveals how greed and how the United States and Britain’s drive to control the Middle East’s oil has destroyed nations and democracy, supported terrorism and turned countries into future-less slaughterhouses. The Power and the Peril of Oil, is a good read for those who would like to know more about the troubles which beset the Middle East. Written in a clear style, which explains the meaning of words and actions, which have been used by the propaganda machine to legitimize their actions of aggression and crimes against humanity. A wise person told me that, if you can find out who is making money out of war, you will see who is causing it. Thank you Firooz. I wish you well with your message of peace from John Lennon’s ‘Imagine’. 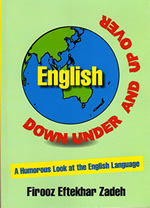 English – Down Under and Up Over is a humorous look at the English language from the point of view of a foreigner studying, learning, and communicating in English. It is not a textbook, but laugh-out-loud stories peppered with idioms, oxymora, and correlated jokes. It is wittily written to illustrate the importance of knowing the multiple meanings of words, the variety of spellings, and the culture, making a difference between understanding or being lost in translation. This book is dedicated to New Zealand and her people. As a result of the unfortunate earthquake disaster in Christchurch, the author and the publisher have donated 100 copies to those affected by this tragedy, in hopes of easing their pain and providing them with a little humor during this hard time. This book is to illustrate in a humorous way how difficult learning English is as a second language. Reading this book will create hours of laughter along with many awareness about the complexity of the English language for both a native speaker and for one who is learning it. English is the most popular language in the world, because of the number of persons who use it, the geographical spread of its use, and the variety of purposes for which it is used. The more widely a language is used, the more potential it has for variation. And the paradox of diversity in unity is more apparent in English than any other language spoken upon, in the entire world. I learned this the hard way in getting my graduate degrees in America, and traveling to Great Britain, Canada, Australia and living in New Zealand. According to Webster’s New World Dictionary, English is one of the hardest languages to learn as a second language. It is the most commonly spoken language in the world, because In every international gathering, English is the official language whether or not there is a representative from an English speaking country participating at the meeting. The language known as “English” and spoken by Brits, Scots, Irish, Americans, Canadians, Kiwis, Aussies, etc. is by no means standardized or homogeneous. In some cases, their differences are so significant that one would think that it is a completely different language! Depending on the circumstances, this can be quite comical or stressful for both the “native” speaker” and a “foreigner.” The pronunciation, the use of words, the many different meanings of a word, spelling, sentence structure, along with colloquial expressions create enormous difficulties that are quite challenging, funny, and most of all confusing. I love to travel, especially to countries I haven’t been before. I consider traveling like a great book, and if you haven’t traveled you haven’t read a page. Being an invited guest lecturer for cruise lines since 2001 has provided me with the unique privilege to travel around the globe that I am very grateful about. Stories, jokes, and slang from New Zealand, Australia, America, and the United Kingdom give good examples illustrating the differences in English depending upon where it is spoken! When I moved to New Zealand, I had to learn Kiwi English which was a different language from the one it took me 35 years in America to reach my comfort zone. I had to start all over again, and I’m learning more everyday. However, it’s not happening fast enough at my age. Pronunciations, slang, and spellings in Kiwi and Aussie English are quite different than American English. What is known as a napkin in the US is called a serviette in Down Under. If you asked for a napkin in a restaurant, you would get a funny look from the waitress. In Kiwi English, a napkin is actually a diaper, or nappy as they call it. And when the waitress comes back and says, “Is that the lot there?” don’t be baffled, she just wants to know if you have everything. Breakfast is brekkie, lunch is dinner, and dinner is tea, so be careful to use the right word when you invite your friends over! If someone tells you that my husband is crook, it is not for being a thief; this word is used for sick! Considering the topic of this book, sit back, and start reading to entertain yourself. And if you see some mistakes in my book, please relax and forgive me. Remembering that, “I no good speak English,” just have fun with it. This is a true story that one cannot help but care about as it is written from the heart and from the poverty and desperation of the Middle East. 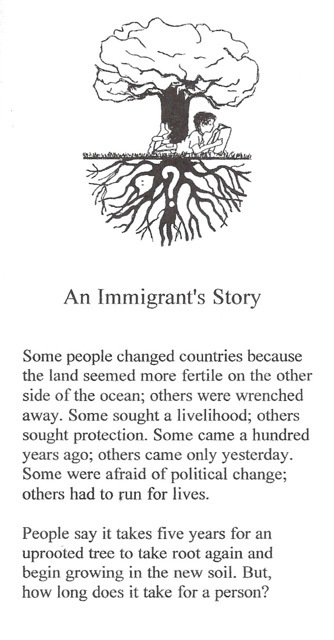 The immigrant’s strength of character and optimism shines throughout the book. This is not only a page-turner, but it is also a mind-opener. 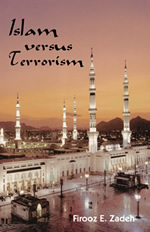 Islam versus Terrorism is is a Middle Easterner’s perspective on the puzzle and problems of the Middle East. Zadeh’s informative book describes Islam, the history of the region, the clash of cultures, and the reasons for terrorism from “their point of view”, with some practical solutions. This pocket sized book is a quick reference and a straightforward explanation of the geography, culture, and internal/external problems of the countries of the region. It describes how some of America’s past foreign policies have created hatred, mistrust, and discord between the United States and the Middle East. This contention resulted in the heinous act of violence on September 11, 2001, and has continued with the present conflict in Iraq and Afganistan, affecting America’s relationship with the rest of the world. This book provides pertinent information on Islamic culture, which dictates the lives of an ever-increasing number of followers, estimated at 1.6 billion. It reveals critical facts about the geographical importance of the region that have been the source of the grave misunderstandings in the minds of Westerners because of false advertisement of the U.S. politicians and mainstream media. It shows how establishing better policies for the U.S. would be a better way in deal with terrorism than attempting to kill them all. The tragedy of September 11, 2001 was a warning, a wake-up call to Americans. It surprised many people, just as Pearl Harbor did. Until the shameful destruction of the World Trade Center and attack on the Pentagon by the terrorists, most Americans simply were not concerned about the world beyond their shores because they had their normal peaceful lives and felt secure that nothing so heinous could happen to them on their own soil. Because of their military strength and the physical distance from troubled area the majority of Americans were not interested to know their government’s foreign policies. World Wars I and II took place in Europe and Asia; the atom bomb was dropped and destroyed Hiroshima, the Korean and Vietnam wars along with Middle East conflicts were fought in far away places. The well-thought out attack by a few fundamentalist Al Qaeda terrorists, resulted in the death of three thousand four hundred innocent people in America, was a clear proof that the U.S. is not untouchable and that there is an unhappy world across the ocean. I believe this devastating attack contained a clear message to the U.S. government to be wary of interfering in other countries’ affairs if they wish not to become a party to the problem, which has been their policy in past. Dictating to other nations how to conduct their lies, especially the Muslim countries that have been vocal in expressing their opposition, could result in more serious consequences in the future. American politicians must learn more about other cultures and people in order to make better foreign policies. The best decision U.S. politicians could make is helping other nations rather than exploiting them for their personal benefit and life style. Sending in military troops and name-calling is not the American Way. They only generate more hatred and aggression. If the U.S. want to play a meaningful role, as the most powerful nation on earth, it is best to be a valuable friend that a big bully. Desperate, poverty-stricken people who are occupied by other countries do not have the financial resources and the influence that their wealthy enemies do. So, Terrorism today is the poor man’s way to fight powerful adversaries. Continued military efforts on one side and suicide bombing on the other will only ignite deeper resentment, hatred, and retaliation in a never ending battle. A diplomatic approach and a willingness to find, soften or remove the causes of discontent would be the best solution. Islam does not promote terrorism, desperation does! If you care about the future of America, If you wonder why the "rest of the world," hates The United States, or if you are afraid of terrorism, YOU MUST READ THIS BOOK! On the other hand, if you believe that we Americans are like the Romans - the Romericans of the new Millennium - and that it is our destiny to conquer and destroy in order to maintain the world according to our standards, then you must read the book to know your enemy. 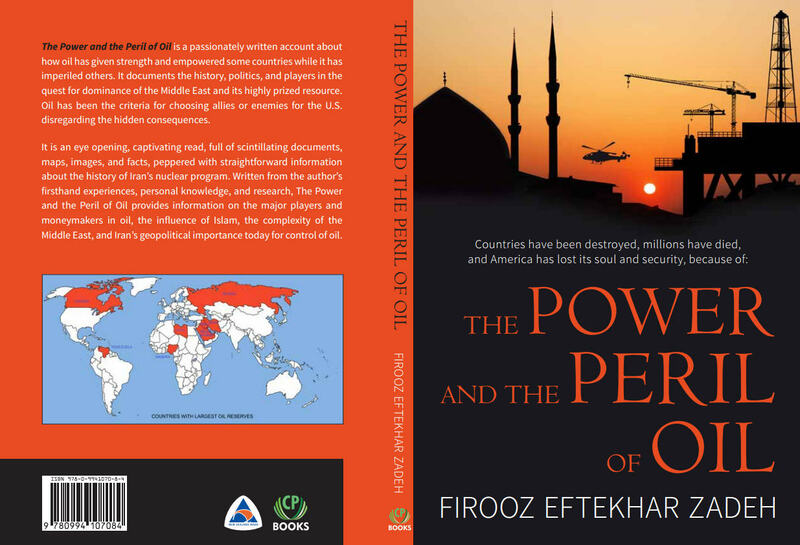 Iranian-American author Firooz E Zadeh has written a detailed book that attempts to explain the sources of and motivation of worldwide terrorism with special emphasis on the Middle East where he was born. The work offers compelling reasons for understanding our enemies and passionate pleas for restraint in dealing with the impoverished hordes that populate the Middle East. Mr. Zadeh does a good job of presenting a complex subject in a way that will hold your interest. A frenetic personal appeal for understanding is integrated with the basic subject throughout.